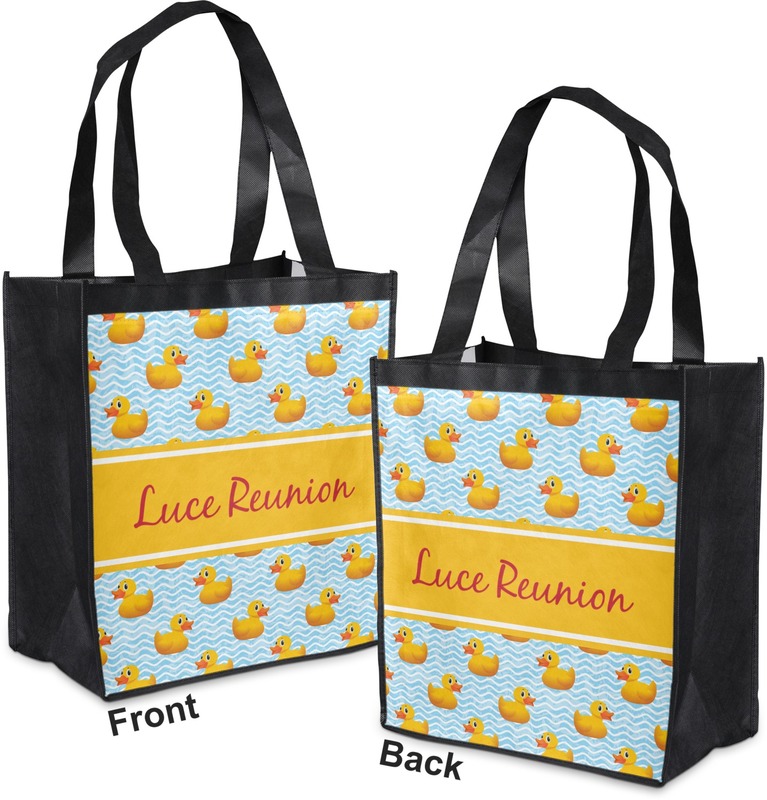 12" x 13.5" x 7"
Grocery shopping is a necessity we have to complete every week, so why not go green with a personalized reusable bag? You will be sure to get some great compliments! This grocery bag is approximately 12" x 13.5" x 7" and holds up to 30 pounds of groceries. It has two large handles which are about 8.5" tall, making it a breeze to carry all kinds of items. 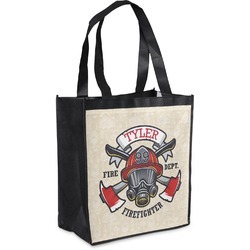 The front and back are printed with your very own personalized design, while the trim and handles are a charcoal black. The coolest part about this bag is that it is biodegradeable! 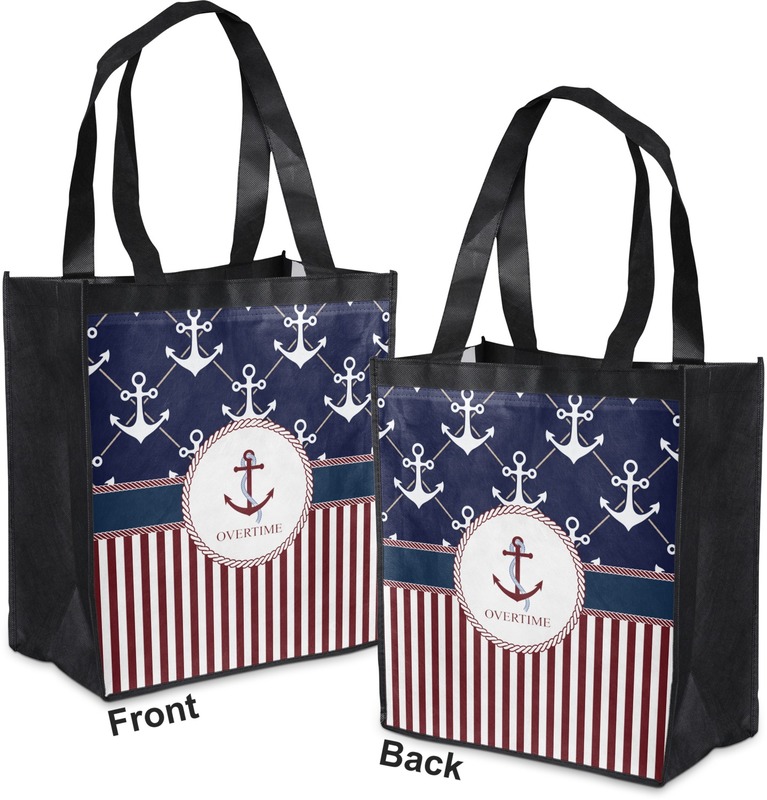 You'll not only be getting a fun designed bag to take to the store, but you'll be helping the environment as well. Choose a fun pattern or graphic to go on your bag. Simply go to our design center and click away! There are thousands of backgrounds and graphics to choose from! If you need any help using our design center, just give us a call or get on our online chat. Our live customer service agents are always happy to help! If you are looking for more bags, you should check out our luggage and bags section! We have a great canvas tote and drawstring backpack that are calling your name! This was an extra purchase in addition to the pillows. It’s your basic shopping bag but I love that I designed it! Received my custom bag for a upcoming family reunion. It will be perfect for our Annual Microphone Contest to carry rubber ducks and frogs to pass out during our number of Splish Slash I was Taken a Bath! Received the bag very fast, well made at a low price. I love that it’s printed on both sides.